Editor's Note: Open Heart is nominated for an Academy Award for Best Documentary Short Subject. What follows, in part, is an interview with director/producer/writer Kief Davidson, when the film screened as part of IDA's DocuWeeks. Sections of the interview have been updated and amended. surgeon, who must also fight to save his hospital, Africa's only link to life-saving free cardiac surgery for the millions who need it. final year of college, and my first project was about Sally Mann, the photographer. I found what I wanted to do, so I spent the next 10 years in the editing room learning from other filmmakers before I decided to step out into the sunlight and start directing. I primarily produced and directed human-interest stories for several broadcasters before making my first features, The Devil's Miner and then Kassim the Dream. IDA: What inspired you to make Open Heart? KD: I was working on a documentary about Partners In Health (PIH), an organization spearheading the "healthcare as a human right" movement in poor countries with under-developed health systems. caring for his patients, Dr. Emmanuel. He was dealing with a ballooning population of children and teenagers who had developed rheumatic heart disease, but lived in a country where no hospitals were capable of performing the surgery that would save their lives. It was heartbreaking for him and shocking to me--a disease that starts with something as easily treatable as strep throat, killing millions of people. Dr. Emmanuel struck me as an incredible fighter facing insurmountable challenges. Eight of his young patients with the most critical diagnoses were in the process of being sent to Africa's only free, high-standard cardiac surgery hospital, The Salam Center, 3,000 miles away in Sudan. Many of them had months to live, with parents who were pretty much out of options, except for admission to this one distant hospital. And each of them had these really engaging personalities, despite their illness and the seeming hopelessness of the situation. When we met these kids, it was just a "Wow, how can we not follow this story?" moment. far-flung areas of the countryside without phone or Internet access. Everything from verifying passports, finding the best flight times for eight sick children, scheduling pre-flight medical screenings, all the way to the organization of their medical records once they arrived at the Salam Center made it immensely challenging to plan a film schedule around. It meant a lot of 2:00 a.m. Skype calls with the hospital staff because of the nine-hour time difference. my crew. The US trade embargo made it difficult to clear customs in Sudan and move around freely. We were really only able to have access after the Salam Center personally vouched for us. Whenever we left the area around the hospital, government monitors closely shadowed us, especially when President Bashir decided to pay the hospital a visit while we were filming. Which reminds me of another disastrous moment. Zak Mulligan, our fearless DP, was backtracking President Bashir when he fell into an open pit! The drop was about seven feet, but miraculously, he managed only to dislocate his finger. Needless to say, I had about 30 seconds to grab and learn how to shoot with our new Canon C300 during this once-in-a-lifetime moment with the notorious leader of Sudan. On a personal note, it became more emotionally exhausting as we grew closer with the families. It was always looming in the back of our minds that one or more of the children might not make it back. Being a parent myself, it made this journey very difficult. KD: This began as one of the storylines of a wide-reaching film about Partners In Health. All of the Rwandan doctors and nurses shown in the film do work with PIH. But by the end of shooting, it became pretty clear that this story didn't really fit into the bigger picture of the organization, so we decided to separate this out as a short piece to really be able to hone in on this story. surgeon and founder of the Salam Center. He struggled with Sudan's government and private funders to keep the hospital afloat financially. As the only free cardiac center in Africa, this seemed like a huge focal point in the story. After screening rough cuts of the film, it quickly became clear that people identified more with the kids and their journey, as opposed to the wider scope of the hospital's place in the global health landscape. IDA: Talk about future plans for this film, as well as your documentary about Partners In Health. KD: We couldn’t be more excited about the future of this film. It’s already making major change on the ground for children suffering from rheumatic heart disease. Phillips Healthcare saw the film and donated a significant piece of medical equipment that’s going to be used to screen thousands of children in Rwanda. We’ve launched a campaign called 52 HEARTS. 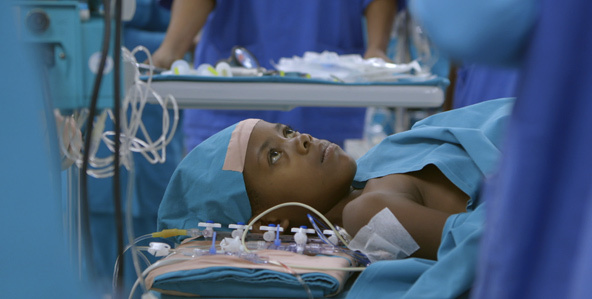 The eight kids we followed were chosen by Dr. Emmanuel and his colleagues from a list of 60 children who all need surgery to ultimately save their lives. Fifty-two are still awaiting life-saving surgery—right now—in Rwanda. We have two goals for the 52 HEARTS campaign: support immediate heart surgery and follow-up care for children in desperate need beginning with our 52, and raise awareness of the deeper issues related to health care and social justice. We’re working to bring attention to the work of EMERGENCY, the Italian NGO that runs The Salem Center, and have already raised a substantial amount of money to assist the Center. The film itself is going to be screening at major medical conferences across the world, in villages as part of a heart health screening and education campaign, and on HBO later this year. As for our Partners In Health documentary, we’re committed to finding a dramatic and compelling way to tell the incredible story of how a small group of unlikely characters essentially changed the course of global health history. It’s character-driven and a historical doc, which is a tall order. It’s a big challenge, but we’re excited about it. Open Heart will be screening Saturday, February 23, at 1:05 p.m. as part of DocuDay LA at the Writers Guild of America Theater in Beverly Hills and Sunday, February 24, at 3:45 p.m. as part of DocuDay NY.